EMKA customers request more and more solutions to prevent unwanted access to switch cabinets or server racks and to monitor accesses. With the new development “eCam” EMKA has responded to this requirement. 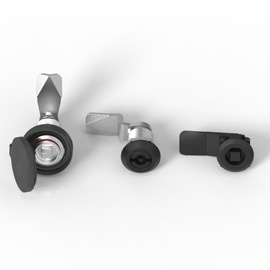 The new locking system includes an electronic cam lock which makes it almost impossible for unauthorised people to open doors or flaps. In this way (perilous) safety zones, for example, on switch cabinets and machines can be secured. eCam can be easily retrofitted and is also available as a system solution via software integration to register and log every access dead on time. In Hannover also the new 180-degree-hinge will be presented. 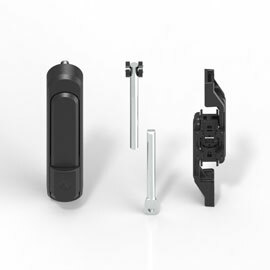 It is particularly suitable for areas or sectors where it is to be made sure that the hinge pin does not get lost. Its primary application is in single and in-line cabinets with single doors and a clearance of 25 mm. The captive pin adds extra security to the complete design. It can be pulled out from the outside up to the limit stop. The door with this hinge can only be unhinged at an opening angle of 90 degrees; if the pin is withdrawn. When the door is closed, however, the door cannot be unhinged. 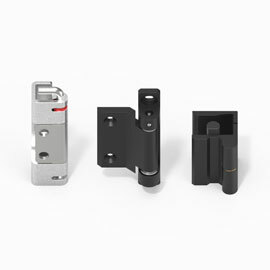 Since, besides the functionality, the demands by the customers for good looking designs are increasing, EMKA has developed a quick-mounting quarter turn with laminated housing plate. 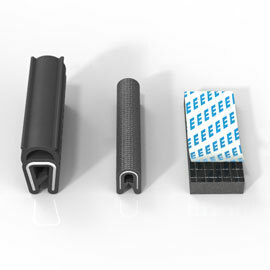 In addition to its proven high tightness (IP69K), EMKA can create the quarter turn in almost any type of look that can be made by in-mould labelling. As a standard version EMKA supplies this product innovation in stainless steel look.